Poptropica’s greatest villain has returned in the BRAND-NEW game and he’s cooked up his most fiendish challenge to date in “Dr. 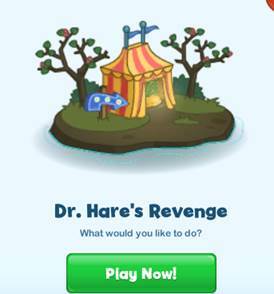 Hare’s Revenge.” When Dr. Hare whisks you away to a SUPER-secret space station you’ll need to race the clock through a series of increasingly diabolical mazes to escape. It won’t be easy! In this fast-paced game, players use trampolines and moving platforms to reach those out-of-the-way carrots and speed through 40 levels of excitement and challenges -- but watch out for spiked “rabbot” drones that will knock you back and cost precious seconds! EEK!